Entry includes: USAT&F certified event, professional timing, music, and plenty of post-race food for all participants. Dri-fit Performance shirt to all participants registered by October 13th, cotton T-Shirt to all registered between 10/14 and 10/27. Awards will be given for Top M/F, and age groups. 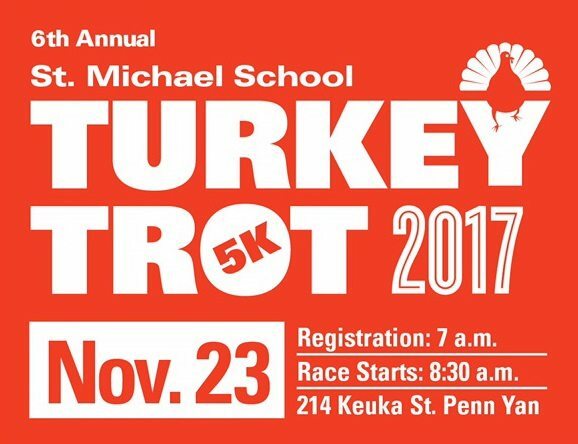 Turkey Trot Food Drive: For every TWO cans of food you bring the day of the race you will receive one raffle ticket for a chance to win some great prizes. Raffle tickets and baked goods will be available for purchase that morning. Raffle to occur right after the winner of the race are announced.